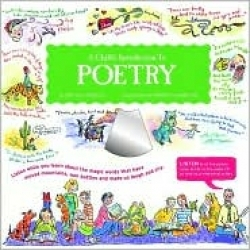 From Shakespeare to Sandburg, Dickinson to Heaney, this book provides children with an attractive introduction into the world of poetry, complete with glossary, CD, and clever, colorful drawings. Parents will be impressed at the range of poems, from limericks to villanelles to nursery rhymes, all of which help reinforce language acquisition in young children. Although the majority of the poets are white males, the editor does include Octavio Paz, Maya Angelou, and Langston Hughes, offering children some sense of diversity and identity recognition with the authors. Driscoll’s work has appeared in LA Weekly and The New York Press, and he previously edited a collection of American Heritage Magazine opinion essays called Underrated and Overrated. He introduces these poems in multiple ways. First, children are visually engaged with witty, droll, line-and-watercolor pictures that represent each poem’s action. The illustrator is a freelance artist and former art director of Newsweek magazine; her previous children’s book is the popular The Story of the Orchestra. Driscoll then provides short biographies so that children can read about the lives of the poets. After that, readers can access each poem as it appears on the page and as they hear it on the CD. Driscoll indicates which track to play for each poem, and explains what children can expect to hear on the CD-a sort of summary of the action and idea. This, combined with a short glossary of terms called “Words for the Wise,” prepares children to engage fully with the poem. The editor also offers a section with some of the poems called “If You’re a Poet, You Should Know It,” which explains a variety of poetry’s primary concepts and forms, such as the villanelle, the stanza, lyric and narrative voice, different genres of poems, and particular poetic devices. With more than sixty tracks, the CD boasts a wide range of poems; the actors who recite the poems are articulate, if not always terribly engaging. For parents of particularly eager pupils, Driscoll supports further investigation with a bibliography at the back of the book, directing intermediate study of the subject. Visual learners, aural learners, kinesthetic learners, and more can enjoy the book and share it with family and friends. As an introduction to the art, practice, and history of poetry, this book is a wonderful choice, particularly with its emphasis on multiple ways of learning.